So far in all of the columns I have written about game shows in this space, I have yet to really talk about Merv Griffin. I will fully admit it, that fact is an atrocity. I have no idea how I let a legitimate god of the game show universe go overlooked for quite so long [In Whitney’s defense, she was in Italy for a little while. -NK]. Griffin gifted some of the most beloved and long-running game shows to the television landscape during his time as a producer and creator. Now, this month’s column won’t be all about the man himself, but it is our first look at a game show he was responsible for. Wheel of Fortune is one of his most well known shows and one of the longest lasting of his entire oeuvre, yet most people under 30 are only familiar with the current syndicated version with Pat Sajak and Vanna White. It has looked and functioned the same way for almost 20 years at this point in time, but there were a variety of iterations before those mainstays showed up that seem unbelievable when you go back and watch them now. Wheel was created more than a decade after Jeopardy! was put on the air in 1975, but aired for the first time the week after the latter show was initially cancelled by NBC (the beginnings of NBC Fail that long ago?). Griffin’s idea for Wheel came about when recalling family road trips as a child, and how his whole family would spend time playing Hangman to make the drive go faster. Because he is a brilliant, brilliant person, it didn’t take Griffin long to transfer the basic tenets of good-natured Hangman into a television show, and then adding a money component to make things more interesting and the stakes higher than bragging rights. If someone tried to do that today, the network would call it “Hangman-ageddon” or something and it would last two months. The days of being able to take a simple concept and transform it into an actual entertaining show that has legs are over, but Griffin took advantage of his era in a big way and Wheel was born. Contrary to what many people think, Pat Sajak and Vanna White were not always the dynamic duo they are today. Wheel has gone through approximately eight different people in front of the camera or as an announcer over its existence, some of who might surprise you. The original host was none other than Chuck Woolery, who was only hired because the first choice was caught reciting the vowels under his breath in order to remember them during taping. Not exactly the best strategy when you’re starting a new job. It obviously worked out for Chuck, because he took that opportunity to launch a seven year career as the host of one of the most popular new shows of the ‘70’s. His original hostess, Susan Stafford, lasted until 1982 but permanently left the show when multiple injuries caused her to miss a few different stretches of filming and eventually forced her to make the choice not to return on a permanent basis. Which is where the changing of the guard finally began to move towards Pat and Vanna. Woolery left in 1981 to pursue other projects (as well as due to a contract dispute with producers). After he departed, many possibilities for a replacement were tested for both Griffin and the network. Merv Griffin himself selected Pat Sajak as the new host, although that choice was immediately met with much pushback from the network. The first real example of Griffin’s temper becoming a positive asset during Wheel flared up here, as he refused to continue any shooting whatsoever until the network hired Sajak on a permanent basis. He got his wish, and one half of the power duo was born. As for the other half, Merv Griffin infamously saw a picture of Vanna White spread out with dozens of other models and actresses and chose her on first sight. To appease the network, she was hired alongside a few other options in a rotating cast of prospects (the others being Vicki McCarty and Summer Bartholomew) for two months after Stafford departed. Vanna was eventually chosen to become the permanent hostess for many of the same reasons someone would be chosen to be a game show sidekick today: intense popularity in the youth demographic and fanaticism towards her fashion influence. Now that the two halves of the current whole were together, you would think that’s where the craziness ends. But it was not to be, as apparently Pat Sajak was content to be the host of a hit syndicated game show and seized the opportunity to become a late night talk-show host for The Pat Sajak Show in 1989, incidentally the same amount of time since his hiring had passed when he left as Chuck Woolery spent on the show. He was replaced for his brief absence (The Pat Sajak Show didn’t exactly light the world on fire) by none other than former placekicker of the San Diego Chargers Rolf Renirschke (yup, you read that right). His late night experiment a failure, Sajak returned to where he truly belonged. The rest is history. The original version of Wheel wasn’t extremely different from what we know now as the standard, with some or all of the rules remaining the same or being tweaked after a few episodes were filmed. Instead of the 2,400 pound behemoth of a steel wheel the contestants spin today, there was a simple cardboard and wood contraption that was vertically mounted on the stage. The playing board had as many as 13 fewer spaces than it has today and there were no video screens to be found. However, most of these changes were made early in the show’s run in order to make the viewing experience easier for the viewers at home. The only piece that took a decent amount of time to change was the ending segment of the show. Instead of walking away with cash as the majority of their prizes in addition to a possible trip or grand prize, contestants were given the opportunity to exchange their money for prizes on the set similar to how a ticket exchange at a local arcade would function. It is jarring to watch old clips using this format now, but I applaud the show for understanding that the gimmick wasn’t working as they hoped and moving on to better things. Watching a contestant realize he or she can now afford a new grill or shiny car once they pass a certain dollar value is decidedly less entertaining than watching them freak out over a vacation or jackpot spontaneously. 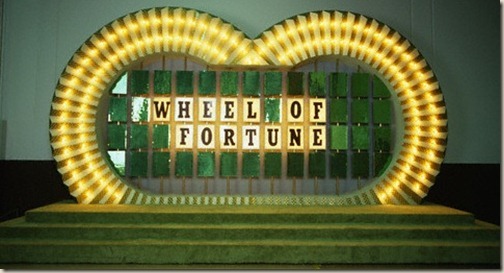 The road Wheel of Fortune took on its way to become the stalwart of an evening syndication block was obviously not a smooth one, but many game shows today could learn a few lessons from the behind the scenes issues that NBC, and later CBS, experienced along the way. At this point in game show production practices, it seems to come down to ego. Every show is propelled by dollar signs flashing behind an executive’s eyes or the pride of whichever host was the first on board. It is more likely for reality competition programs to tweak their formats to survive because those shows are more important to networks’ long-term success. The most successful example of a network willing to change the format of a formerly successful game show in order for it to transition to daytime syndication achievement would be Who Wants to Be a Millionaire?, a show that fizzled much faster than Wheel did before it made its relevant changes. Fortunately for audiences and producers alike, Wheel of Fortune is celebrating its 30th Anniversary Season, complete with hilariously dated flashbacks from the entire history of the show preceding the show each night. So be thankful for a team of producers 20-something years ago realizing what sort of gem they had and the need to make changes to transition it from decade to decade. Here’s hoping we can continue to enjoy Wheel at 7:00 on the dot every night for another 30 years and beyond. I was fortunate to be a contestant some years back. Great fun. 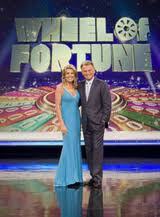 Vanna White was as charming as she is attractive and Pat Sajak was personable and friendly. That’s very cool! I’ve heard the audition process can be very extensive so congrats for being personable/unique enough to get through all those rounds. Must have been quite an awesome experience. So to be clear, you’re pushing for the cancellation of Jeopardy, and moving Wheel to 7:00 as its replacement? You must have read that incorrectly. That word “continue” is very important. Because it has always been and always be on the hour. 30 years! Pushing for the cancellation of Jeopardy is the worst move that any TV station could make, whereas pushing for the cancellation of Wheel Of Fortune is the best move that any TV station could make. When Wheel and Jeopardy air depends on the channel. It’s 7:00pm and 7:30pm but the order depends on the local channel’s syndication agreement. Oh no I know that. It’s a little bit of an inside joke between Andrew and I, if you follow us on twitter you’ll see that we’re just being dumb about when the two shows *should* air, not when they actually do. Fun fact for you though, 65.5% of America has Jeopardy second, Wheel first in their syndication agreements. Thus proving that a majority is not always right.